Enjoy a complimentary hotel pick up, that will take you to the departure terminal, in the center of the city. During the sightseeing tour by air conditioned motor coach get amazed by the impressive buildings in the Bourbons quarters, dive into the History of our country in the old Madrid area, at the Hapsburg quarter, get to know the Alcalá Gate and the City Hall, Plaza de Cibeles, Gran Vía, Paseo de la Castellana, Paseo del Prado, etc. Continue to the skyscrapers Madrid and the business area of the city. Departure at 9:00 from the main street of the city, the Gran Via Street, to have a complete view of the capital of Spain. Start from the beginning by visiting the place where the city of Madrid was founded, the hill where today the Royal Palace and the Almudena Cathedral are located. Continue to the Old Madrid area, the Hapsburg Madrid, and get soaked by the medieval ambient, in its narrow streets, and its unique Plaza Mayor. 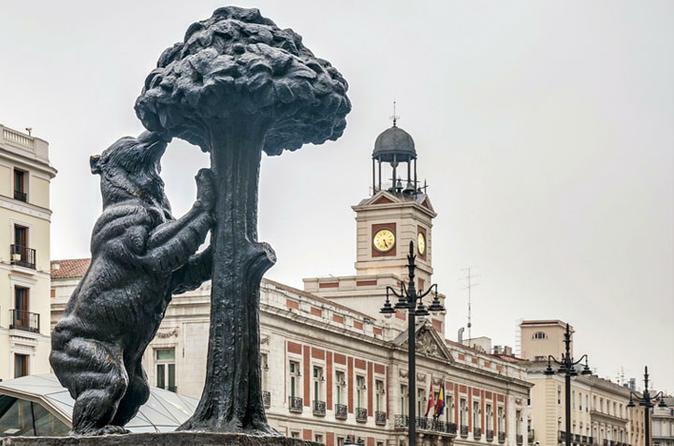 Continue to the famous square of Sol, to connect with the Bourbons Madrid, and get amazed by its impressive white buildings; in this area, discover one of the largest art centers in Europe, the Art Triangle area, and the beautiful Retiro park, right in the middle of the city. Afterwards, lead to the most modern side of the city, the skyscrapers Madrid, and the Paseo de la Castellana, but without missing first the Ventas bullring, the most important bullfighting venue of the world. In this modern area, also discover the most famous stadium of the city, the Santiago Bernabeu stadium.